The CDE committee organized it’s fifth CDE program on 28th December 2018. The topic of the day was Horizons Beyond BDS. 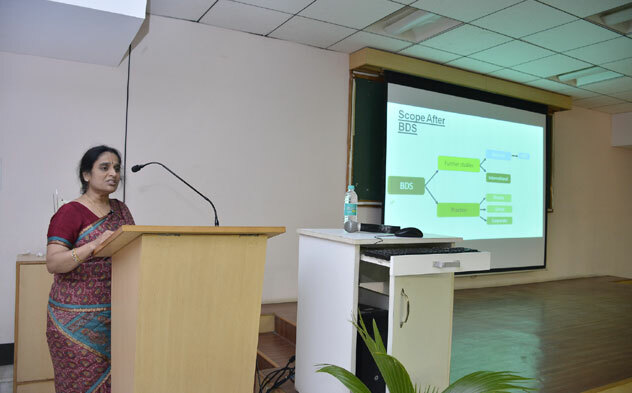 The Speaker was Dr.Mythili Srinivasan, Oral Pathologist from Indiana University, School of Dentistry and Director- Salivary Research and Immune Therapeutics. Welcome address was delivered by Dr. H .Thamizchelvan, Chairman CDE committee, our Vice- Principal Dr Sathasivasubramaniam graced the occasion and speaker introduction was done by Dr. Malathi, HOD Department of Oral Pathology. Nearly 80 participants ( including interns, postgraduates and staffs) benefitted from the lecture. The beneficiaries gained knowledge regarding research, higher education and job oppurtunities after BDS. The participants enjoyed and appreciated the program.